The new bill would restore the financial health of multi-employer pension plans, which are common in construction and other industries where workers are employed by many different contractors. Sen. Bernie Sanders, Ind-Vt. who also introduced the bill, said it could save the pensions of up to 10 million workers the multi-employer plans cover. Called the Keep Our Pension Promises Act, Sanders introduced the measure last year as well. Rep. Marcy Kaptur, D-Ohio, has introduced a companion bill in the House. To show support for the measure, members of Minnesota Pension Rights and of the Teamsters—whose multi-employer Central States Pension Fund faces insolvency—organized a rally at the state capitol in St. Paul. 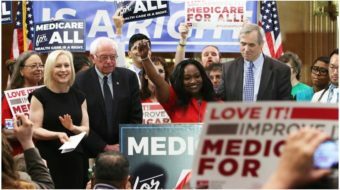 It coincided with similar events nationwide and a news conference with Sanders, Sen. Al Franken, DFL-Minn., Machinists President Bob Martinez and several others. As an actor and screen writer, Franken knows what it is like to be in a multi-employer pension plan. Besides the Americans covered by multiemployer pension plans, 30 million more are in single-employer pensions. The Pension Benefit Guaranty Corporation oversees and insures both. In 2014, Congress changed the rules, allowing struggling pension plans to cut workers’ promised benefits now, with approval from the U.S. Treasury Department, to keep the plans solvent later. 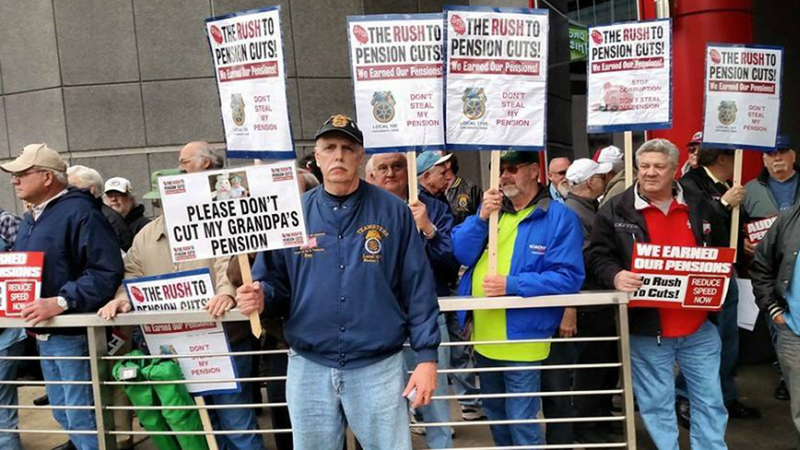 Some of the 400,000 workers and retirees covered by the Teamsters Central States Pension Fund faced cuts of 50 percent or more. Some 18,000 affected Teamsters live in Minnesota. Treasury rejected the planned Central States cuts. Retirees depending on that plan have been spared — for now. But the long-term future of the Teamsters’ benefits remains in doubt. Treasury has also rejected several other multi-employer plans who wanted to cut present benefits to preserve future solvency. It called their proposals inadequate. But it approved cutting the pensions for beneficiaries of Ironworkers Local 17 in Cleveland. Two-thirds of voters there agreed to cut their present benefits in order to keep the plan solvent beyond 2024. The plan covers 1,938 people, and just under half voted, the union said. The Keep Our Pension Promises Act would boost funding for the PBGC so it can keep the promises made to pensioners, by closing two tax loopholes used by the wealthiest Americans. It is currently the only legislative solution to the multiemployer pension crisis, Franken’s office said. Participants at the rally in St. Paul welcomed the federal legislation. U.S. Reps. Keith Ellison, Rick Nolan and Tim Walz, all DFL-Minn., joined them. The three, along with Rep. Betty McCollum and Sen. Amy Klobuchar, both DFL-Minn., who could not attend the rally, pledged their support for the Keep Our Pension Promises Act. Other backers include Sens. Claire McCaskill, D-Mo., Tammy Baldwin, D-Wis., and Sherrod Brown, D-Ohio, Reps. Marcy Kaptur and Tim Ryan, both D-Ohio and Debbie Dingell, D-Mich., and both Democratic U.S. Senators from Michigan and Rhode Island. “I will fight every day to defend retirees. No matter where retirees draw their retirement, whether it is a pension, a 401(k) or Social Security, Americans deserve financial stability and security in their older years,” Kaptur said at the D.C. press conference. “A secure retirement is a central pillar of economic security for our working class. The Keep Our Pensions Promise Act ends a loophole and tax break for the wealthy so we can protect the retirement security families have worked for, planned for and depend on,” Baldwin added there.